- I'd like to rectificate, the background img were taken by ether, when I saw it I felt that I must do something about...so I did this wall. I made it bigger and used in it some photoshop filters and textures. 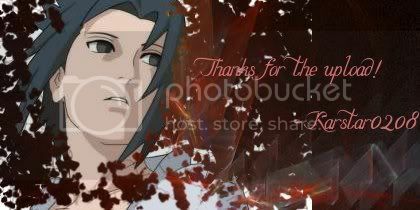 - The Naruto img was captured from the fist ending of the anime. - Sakura flowers were taken form deviantart.com, it was so dificult think on a composition for them, and sasuke is look up so I had to put the flowers at the left high corner. All the photos were really dificult to clean and extract. - Sasuke and itachi scan was the picture I was looking for to do the wall with the background I wanted. - I added a fish flopping and other fishes down the water. Finaly I want to say that I really like this wall, it was inspired by the song wind, of Akeboshi, from the first ending, I wanted to do a wall that gives serenity...something really sweet, and little Naruto at the back gives a touch of sedness...it's cute. Hope you like it a lot! great use of the scan ! just the best wall of this scan ! Good job it's wonderful I love it! sweet indeed! 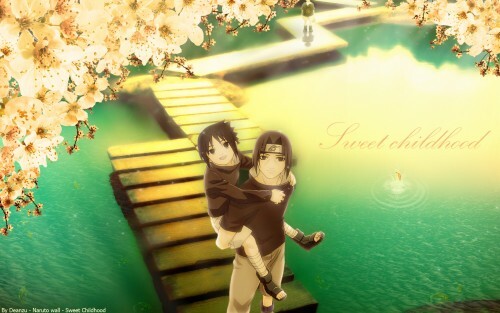 putting little sasuke in the back is nice! i love how u've captured both the sadness and the most cherished moments of the past. Thanks a lot for sharing this pic. ^-^ !